Different trailers mean differnt types of products to haul. Personally, I have pulled three types of trailers: refrigerated (reefer), dry box, and flatbed. They all have their advantages and disadvantages. Most trucking companies will specialize in one type of product and therefore, only use one kind of trailer. Some companies use trailers which haul a variety of products. In my 10 years on the road, I was lucky enough to experience a diverse number of products which required different trailers. I wouldn't have had my time on the road any other way. I feel that I would have become bored with hauling only one type of product with one type of trailer for an entire decade. When I first began driving team with my husband, we had a refrigerated trailer. Produce, frozen, and refrigerated goods are always in high demand and this is what we hauled the most. The biggest advantage to hauling goods that needed to be refrigerated was the demand. Who purchases produce, frozen and refrigerated items? Everybody who buys groceries, that's who! And how many people do that? Everyone! So this is an area that will always be in need. Another advantage to using a refrigerated trailer is that you can also haul dry goods. All you have to do is turn off the refrigeration unit. This opens up opportunities to haul a wide variety of products with just one trailer and, in most cases, have a better chance of getting a load and going down the road as opposed to having to wait for a load. The disadvantages of a reefer trailer are refrigeration unit failure and driver error, as you may read of in my blog Bad Directions. Also, as a newbies to hauling produce need to note, if produce is ripe when it's loaded on a trailer going from one coast to another, it will be over-ripe and rejected when you get to delivery. Produce has to be underripe or just beginning to ripen when it reaches its destination. If it is too ripe, spoilage begins and nobody buys spoiled produce, especially the market you're delivering to. Hubby and I also hauled a few "dry boxes". These are plain trailers with no refrigeration units. These are great in that you don't have to worry about the unit keeping the proper temperature or breaking down. The only drawback is that you can't load a refrigerated load and must wait for a dry load. So if dry freight isn't moving as often as refrigerated freight, then you could be stuck waiting instead of making the miles. For a while, we also pulled a flatbed with a covered wagon kit. The covered wagon kit consists of straight poles that fit into pockets along the sides of the trailer and arched poles that connect each pair of straight poles. Then a tarp or cover is pulled over the arched poles to create a "covered wagon" effect. The advantages to using one of these trialers is that you could haul a load of lumber to the east coast, then pick up a load of racing engines using the covered wagon kit. The thing that irritated me the most about having one of these trailers was that it seemed that every other load needed the cover, so we were constantly changing from flatbed to covered wagon to flatbed to covered wagon. Several loads with one or the other would have been nice, but it just wasn't keeping us rolling down the highway. I didn't find it much fun putting up the wagon kit, and it took a lot of time. There are lots of different trailers to pull (I've only mentioned three of probably dozens) made for lots of different loads and they all have their own "goods" and "bads" associated with each one. 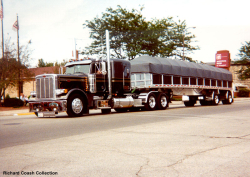 As I mentioned in the beginning of this blog, the type of trailer you pull as a truck driver usually depends on the company that you driver for. When applying to drive for a company, be sure to ask what type of product you'll be hauling and what type of trailers they use to ship that product. This will give you a better idea of what to expect when you're looking for that new career "on-the-road".